The Timbavati Game Reserve is located at the border line between Hoedspruit in (Limpopo) and Acornhoek in (Mpumalanga), north of the Sabi Sands Private Game Reserve on the western edge of Kruger National Park. 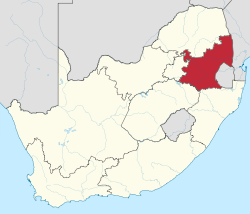 Geographically and politically, Timbavati is located in Mpumalanga Province. In Xitsonga, the name 'Timbavati' means "the place where something sacred came down to Earth from the Heavens," and refers to the rare white lions of Timbavati. The reserve was established in 1956 by like-minded game farmers with the creation of the Timbavati Association. The association has 50 members and covers 53,392 hectares (533.92 km2). Timbavati is part of Associated Private Nature Reserves (APNR) and the fences separating Timbavati from the other member reserves in the APNR and from the Kruger National Park has been removed. Wildlife, including lions, cheetahs, elephants and other species, roam freely between these reserves. Ngala (meaning 'lion' in Tsonga) and Motswari game reserves have been amalgamated into Timbavati. Insensitive land use (primarily crop and cattle farming) had caused soil erosion and destruction of indigenous plant species. In addition, natural water sources had been rerouted by dams further impacting on the natural status quo. As a result, much of the wildlife common to the area was lost. In 1993, in recognition of the importance of the area, the fences between the Kruger National Park and the Timbavati Reserve were removed to encourage natural species migration. Man's incursions into this part of the Lowveld have always been temporary and brief, from early stone age down to the early 20th century. In point of fact, large tracts of land in the northern portion of the Lowveld were never permanently settled by man. The lands now comprising the Timbavati were barely touched, and are still only lightly inhabited. This part of South Africa's bushveld region may therefore be regarded as truly unspoiled and deserves recognition as genuine wild land, as opposed to the "restored" and "restocked" lands commonly found elsewhere. The Timbavati Game Reserve is located in the Mpumalanga province of South Africa between latitudes 24° 34’ S and 24° 03’ S and longitudes 31° 03’ E and 31° 31’ E. The Timbavati Reserve consists of 50 contiguous tracts of land housing 12 luxury tourist lodges. The reserve forms part of the Greater Kruger National Park and lies nestled between the Kruger National Park on the east, the Klaserie and Umbabat Game Reserves in the north and the Thornybush Game Reserve in the west. There are no fences between the Timbavati and the Kruger National Park which allows free movement of wildlife between the reserves. The world-famous Kruger National Park is a conservation area of more than 20,000 square kilometres (7,700 sq mi). The southern border of this great complex of public and privately owned protected land lies close to the Kingdom of Swaziland and abuts the boundaries of Zimbabwe in the north and Mozambique in the east. The terrain is undulating with altitudes varying between 300 and 500m above sea level. The area is characterised as ‘savanna bushveld’ with 6 different landscape types: acacia woodland, open woodland, mopane woodland, combretum woodland, mixed combretum woodland and mixed veld on Gabbro. Bush elephants, African buffaloes, kudu, Burchell's zebras, blue wildebeests, Cape giraffes, impalas, waterbucks and warthogs abound together with their attendant predators including lions, African leopards, South African cheetahs and spotted hyena. The endangered Cape wild dog is also a regular visitor to the Timbavati Game Reserve. The larger and rarer antelopes such as roan antelope, common eland and tsessebe have been slow to return to this area and their numbers are still critically low. The climate is typified by a summer wet season (October–March) with the majority of rain falling between December and February. This is also the hottest time of the year, with temperatures in the region of 32 °C. A typical summer day will be hot with storm clouds gathering for a spectacular late afternoon thunderstorm. During the winter months (April–September) the weather is dry with little chance of rain. As game tends to congregate around dwindling water sources, game viewing is more predictable. Temperatures can range from 28 °C to 10 °C in one day. The mornings and evenings can be very cold and warm clothing is very strongly recommended. Sunset over Timbavati Game Reserve. Over 40 mammals, including the African Big Five: lion, African elephant, African Buffalo, African leopard and black rhinoceros. 85 listed species of trees. A white lion cub at Kromdraai, South Africa. When the white lions of the Timbavati were discovered in the mid-1970s they became the subject of much interest and debate. The story of the "White Lions of the Timbavati" has been told by several people, including Chris McBride. McBride was the son of Timbavati member Cyril McBride, who at the time owned the farm Vlakgezicht, together with his brother Robert. Lions with a recessive gene causing the coats to be snow white (though not albino) reappeared in the Timbavati in 2006 after an absence of many years. Their white coats are not the product of albinism, a relatively common condition resulting from a failure to develop pigment, but from another condition called "leucism," in which the pelt is white but eyes and skin are pigmented. The condition is rare and also termed a "chinchilla mutation." It is thought to represent an evolutionary stage in the progressive loss of pigmentation. The white mutation, which affects two of the pigments involved in coat coloration, is expressed only when two conditions pertain: (1) Both parents carry the recessive "white gene"; (2) the offspring inherit the recessive gene of each parent. If a cub receives a dominant "tawny" gene from either parent, its pelt will be tawny. Thus a litter may contain both tawny and white cubs. Timbavati is approximately 5 or 6 hours by car from Johannesburg. Normal passenger vehicles can reach all lodges within the reserve. Regularly scheduled, daily flights are available from Johannesburg and Cape Town to local airports. ^ a b "Timbavati Private Nature Reserve (TPNR)". Simbavati River Lodge. Archived from the original on 15 December 2009. Retrieved 11 December 2009. ^ a b Turner, Jason (November 2005). "The impact of lion predation on the large ungulates of the Associated Private Nature Reserves, South Africa". Pretoria: University of Pretoria. pp. 49 & 56. Retrieved 10 December 2009. ^ Harrison, Philip (2004). Ecotravel. Volume 2 of South Africa's top sites. New Africa Books. p. 42. ISBN 0-86486-566-X. ^ Oosthuizen, Johan (2009). "The Development of an Integrated wildlife disease surveillance and monitoring system for the disease management in free ranging wildlife in the Greater Kruger National Park" (PDF). Retrieved 10 December 2009. ^ "Location and Map". Timbavati Private Nature Reserve. Retrieved 17 June 2013. ^ Macleod, Fiona (2005-03-18). "White lions return to Timbavati". Mail & Guardian. Retrieved 11 December 2009. ^ "GUIDELINES FOR THE PREVENTION OF MALARIA IN SOUTH AFRICA" (PDF). South African Department of Health. p. 40. Archived from the original (PDF) on 16 February 2010. Retrieved 11 December 2009.